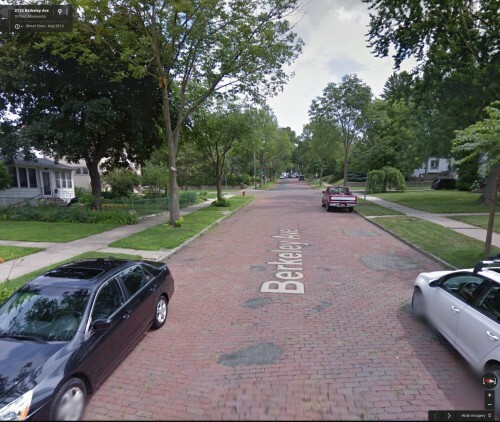 This blog is about streets and yet we rarely talk about pavements, the road surface itself. The most common materials are bituminous asphalt and concrete, with asphalt more common on low volume local roads and concrete on higher volume freeways. The general reputation is that concrete is stronger and longer lasting but more expensive and more difficult to construct and takes longer to set. 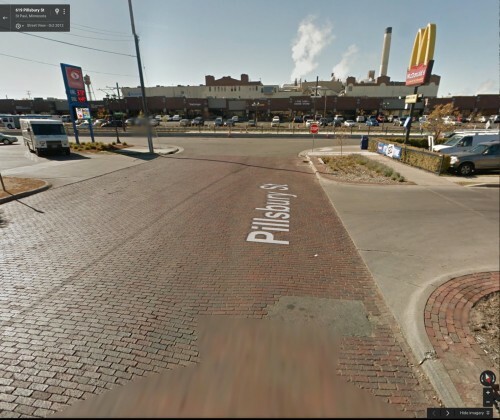 At St. Anthony Main, Minneapolis, the Street is Brick and the Path is Asphalt. For a brief window in the late 2000s, concrete actually had a price advantage, which explains the surface for the Marq/2 project in Minneapolis. They have other properties and claims made about them. For details on the pavement wars see ConcreteIsBetter.com and AsphaltIsBest.com (seriously, visit their sites, then come back (better yet, visit their sites from 10 or 12 years ago at archive.org (concrete) (asphalt)). Grammatically, if there were only two choices, the concrete folks would be more accurate. However there are more than two choices. A third choice is plank roads. These were once common (in the 1840s and 1850s) when forests were still virgin and it was an improvement over dirt, and more cost effective, were it to last. Sadly it did not last. 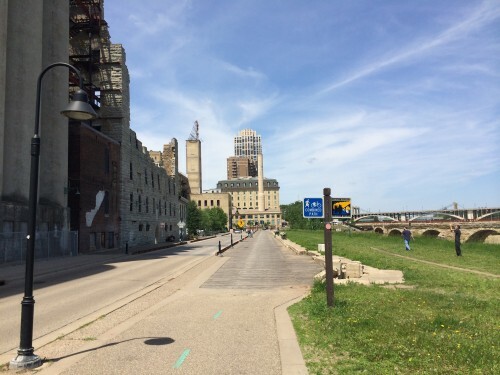 To recall the days of plank roads the Mill City Museum had a plank section installed just outside on West River parkway. Sadly recalling the earlier experience with plank roads, it too rotted before its time, and the other disadvantages (rough surface compared to asphalt) led to it being pulled out on the auto path, though it remains for the bike/walk path. A fourth choice is brick. 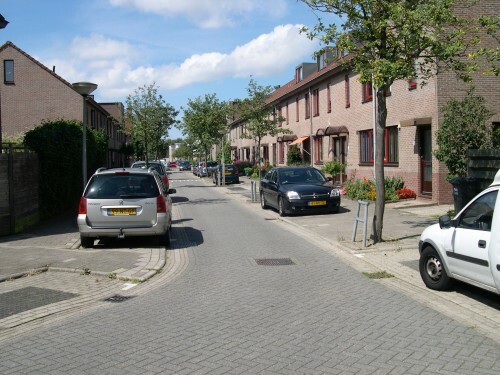 Fans of the Woonerf, as I have been since reading Streets Ahead, know that many neighborhood streets in the Netherlands have either retained or been restored to a brick or cobblestone surface. This encourages vehicles to slow down and connects the walking, playing, parking, and driving surfaces into one. There are many designs. 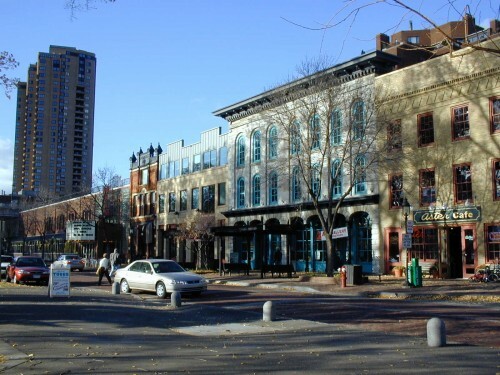 But this is Minnesota, we can’t have brick-clad Woonerf here, can we? Yes, yes we can. Once our roads were brick too. The vernacular design differs with the local Midwest environment, but the underlying logic remains the same. In many places, the asphalt is simply laid over the brick. (How many, I don’t think anyone knows, as the records, if they remain, are on paper in boxes at an archive.) In some places they have been uncovered. Some examples from St. Paul are below. In some places, like some streets and alleys in the Minneapolis Warehouse District, they were never covered. While snow and ice are harder to clear from brick than say asphalt, that too is a traffic calming measure. And there is no requirement that on residential streets snow be plowed to the surface. A compacted snow pack over residential streets will help preserve the pavement compared to scraping them with metal blades. The merits of respective building materials can be argued, but eventually, about the time we have flying cars and real hoverboards, the more attractive brick will again dominate asphalt and concrete for residential and shopping streets. In the meantime, we can prepare for that day and try to resurface and uncover more and different road materials to help create better looking neighborhoods and living streets for people.